I like Pythonista (previous review) and I was impressed with the previous update. 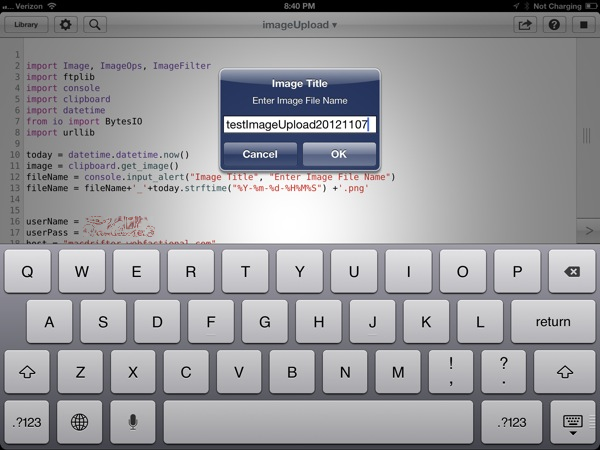 Pythonista is a well designed implementation of Python on iOS that goes far beyond just being a dumb shell. The developer, Ole Zorn, has a new release out today that raises the bar considerably. This post will serve as an introduction to some of my favorite new features of Pythonista but also as a practical guide to how I use it. But there's much more to this release. 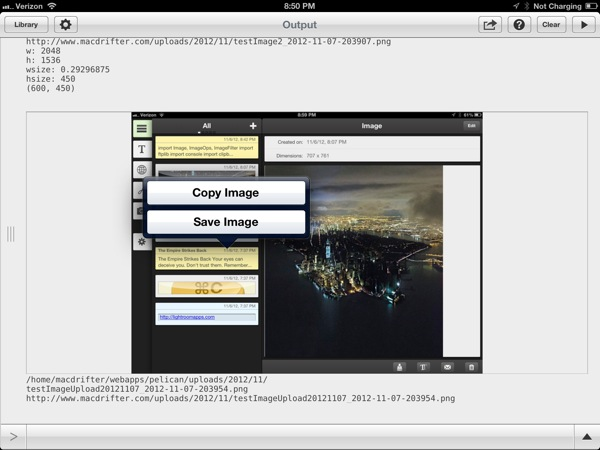 Access to the iOS clipboard has always been part of Pythonista but version 1.2 expands on it. Now images can be accessed and pushed to the pasteboard too. There's also better text handling for strings (or at least it feels better). Here's a blatantly stolen version of Dr. Drang's MultiMarkdown table normalizer. Put an ugly MultiMarkdown table on the clipboard and run this script to have a pretty MMD table returned. "Justify a string to length n according to type." "Aligns the vertical bars in a text table." # Start by turning the text into a list of lines. # Figure out the cell formatting. # First, find the separator line. # Delete the separator line from the content. # Determine how each column is to be justified. # for the entire table. # Extract the content into a matrix. # Put exactly one space at each end as "bumpers." # Append cells to rows that don't have enough. # because that matches an empty column with "bumper" spaces. # Recreate the format line with the appropriate column widths. # Insert the formatline back into the table. # Return the formatted table. # Read the input, process, and print. PIL is an impressive Python library. It can do a hell of a lot with an image. It can extract data and manipulate an image in almost any way. PIL is now available in Pythonista and it is ridiculously easy to use. Here's an example that I made. This script reads an image off of the iOS pasteboard. It then resizes the image proportionally to have a 600px width. Finally, after asking for a file name, it uploads the image to my FTP server here at Macdrifter and puts a URL to the image back on my pasteboard. Through the use of Pythonista's console library, I'm able to use standard iOS text inputs and alerts. When the script runs, the console not only shows me my output values such as the new old and new dimensions but also the newly resized image. Tapping and holding on the image in the console allows me to copy it to the pasteboard or save it to my camera roll. There you have it. Pythonista is my Keyboard Maestro on iOS. Making little utility macros is easy with Pythonista and the programming environment is luxurious. The code completion is excellent, the syntax highlighting is attractive and functional. Pythonista 1.2 adds the Markdown library. 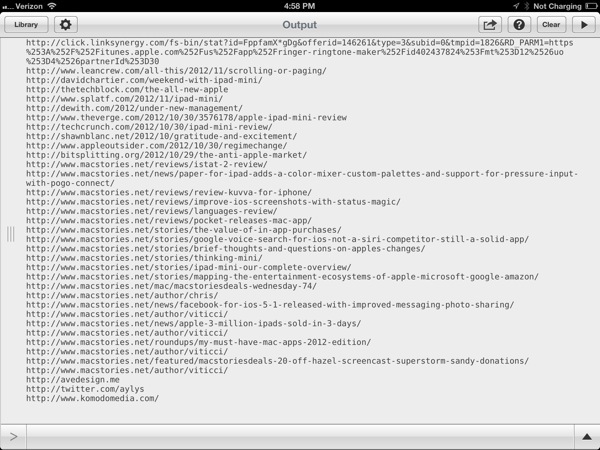 Just about anything that Python Markdown can do on the Mac, I can now do on iOS. I still use this heckyesmarkdown trick but I plan to rewrite it with some new Markdown tricks. Pythonista adds its own variation of BeautifulSoup, the Python library for working with HTML. There's some fun stuff that can be done. For example, here's a Pythonista script that extracts all URL's from the a given page. To use this script, I copy a URL to my iOS clipboard and then run the script. The console captures every URL found. Code snippets can now be directly uploaded to GitHub from Pythonista. This is a very convenient way to share code with your friends, like I've been doing with Federico Viticci during the beta testing. Getting code into the app can be more difficult. Apple restricts apps from directly importing new code and executing it. It's a security measure that I generally agree with. However, with just a little Python, Pythonista can import code from a GitHub link on the clipboard. The script is not available by default, so get it here. Pythonista adds a new URL scheme so other apps can launch Pythonista and run a named script with parameters. That's pretty powerful stuff. The URL scheme also means specific scripts can be saved to the home screen as a quick launch tool. Just visit this handy tool the developer provides to easily create one, complete with an attractive Pythonista icon that looks right at home on my iPad. There is now a Pythonista forum. Users can share code, ideas, or pretty much anything. The forums are already filling up with amazing examples (thanks to the developer). 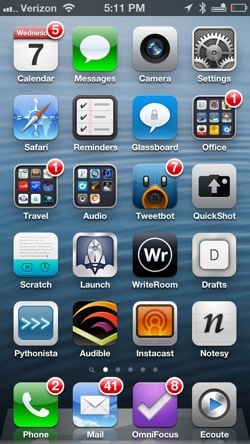 It's hard to believe all of this can happen on an iPhone or iPad. For example, turn any device into a web server or a script that uses the Python Dropbox module to list, upload and download files. My only real complaint is that Pythonista does not have a better way to organize code. I have a lot of scripts now and they are shown as a single list. I'd love folders. iOS limits how Pythonista can be used. I already mentioned the restriction against automatic side-loading of code. There are also limits of making the run-time available to other apps. That means Pythonista must still be directly launched to use a script. It can not be used as a framework for other apps. Ole Zorn (omz software) is the developer of Pythonista and his attention to detail really shines in this app. It's not just attention to design (the app is very pretty) but he also gets what Python users want. He adds useful libraries and subtle tricks to Pythonista in every update. Notice something? 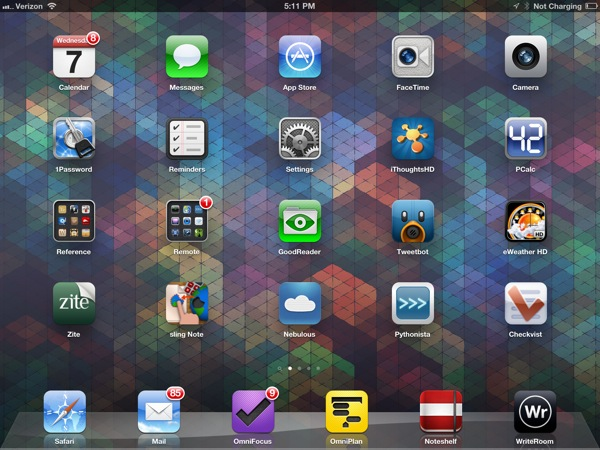 Pythonista is strategically placed on the first row of the first home screen of both devices. Enough said.